Fashion Blog - Build an ideal wardrobe with the mix and match possibilities of Sympli. Build an ideal wardrobe with the mix and match possibilities of Sympli. In a perfect world, everything in our closet would go seamlessly together. Never would we find ourselves lost in a sea of fabrics and mismatched blacks, red leather jackets reminiscent of Michael Jackson’s Thriller or sizes we haven’t worn in years. But that, for most of us anyway, is the state of our closet – an a la carte of our past and present finds. Building a wardrobe isn’t the easiest of tasks. Each item has to function with the others to ease our morning routine and provide multiple options. Sympli clothing offers a diverse collection of pieces that are not only stand-alone, but are a cohesive collection that can be layered, mixed and matched. These versatile pieces help our closet to become a place of empowerment instead of frustration. Are you ready to organize your wardrobe? Do you want to make selecting an outfit more streamlined? Do you want to ease the strain of packing and lighten your travel load? The little black dress is a wardrobe staple that can be worn year after year providing effortless style and comfort. Sympli offers a vast array of basic dress silhouettes that can be wardrobe basics in black or special occasion outfits in fabulous colors. In addition to the little black dress, Sympli offers a diverse collection of classic wardrobe staples and special occasion pieces in more than 30 colors! Sympli’s collection of luxurious jersey knit tops, jackets, pants, skirts and leggings provide endless possibilities for all body types. T. Many companies offer black jersey basics, but we love the well-designed, flattering styles of Sympli and their high-quality, washable jersey. We love to pair the Sympli Diva Leggings with the Sympli Mini Skirt. The mini skirt is perfect for any top that is just a little short of a tunic; it provides easy coverage at just $58! We can then incorporate a range of tops creating a day look or an evening statement. For day, add the Sympli Best Tee in White or whatever color you’d prefer from their 30+ selection. Layer the Sympli Diva Vest over the top for a fun accent to the Diva Leggings, or try the Sympli Dash Jacket for a more professional look. For evening, pair the Diva Leggings and Mini Skirt with the Sympli Focus Tunic. Or go for a trendier silhouette by pairing with the new Sympli Envy Tunic which features a high-low hemline. The Perfect Pant is the workhorse of your wardrobe. Sympli offers a great collection of wardrobe staple pants perfect for any occasion and for all silhouettes. These foundation pieces mix and match effortlessly with your Sympli tops and jackets. The Sympli Long Narrow pant provides a lean silhouette that fits most women but is wider than leggings. This pant continues to sell out at Details. It is a perfect basic for work or travel. The Sympli Pure pant is perfect if you carry your weigh in your thighs and prefer a wider legged pant that flatters your shape.Team any of these pants with the urban jacket and you have a soft suiting look. The Sympli Dash Pant is the go-to piece for making legs look longer and slimmer. The pant features a curved seam that creates a slimming effect while making the legs appear longer. Pair with your perfect pump and the Sympli Dash Jacket and you’ve got a modern take on the power suit that will not only flatter your figure, but get you noticed for all the right reasons. Oh and did I mention that most women feel like they just lost 10 pounds when they try on Sympli! 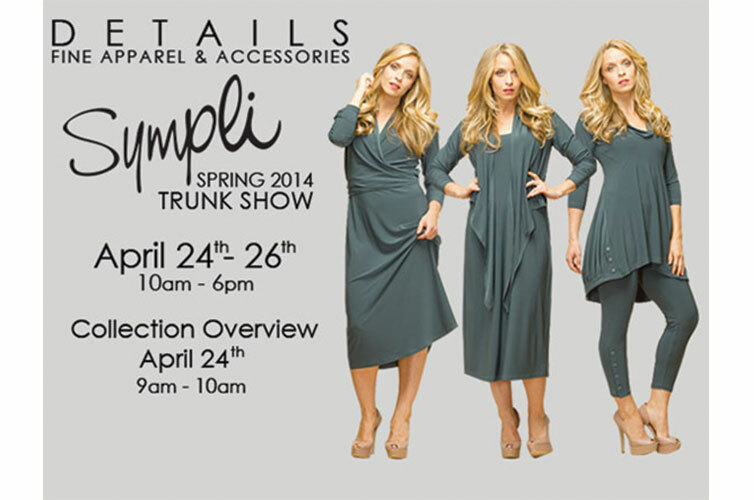 Join us April 24th – April 26th for the Sympli Spring 2014 Trunk Show to see all the great new pieces perfect for your wardrobe.